Templates designed by Judy Niemeyer, work with her diamond wedding ring paper-piecing pattern. 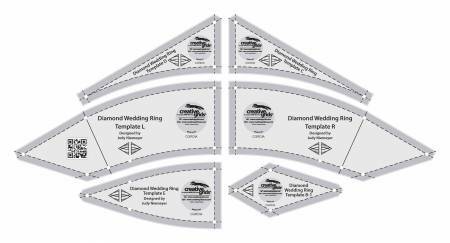 Use these templates to cut the segments needed to create other diamond wedding ring quilts as well. These angles work with the Creative Grids 60 degree ruler (Item #CGRT60). Cut the curves with a 45mm or 60mm cutter. Creative Grids Rulers have a MAP (Minimum Advertised Pricing) Policy. Please do not advertise them for less than the suggested retail.